Perfect for home video recording, transferring home movies, storing digital pictures, etc. 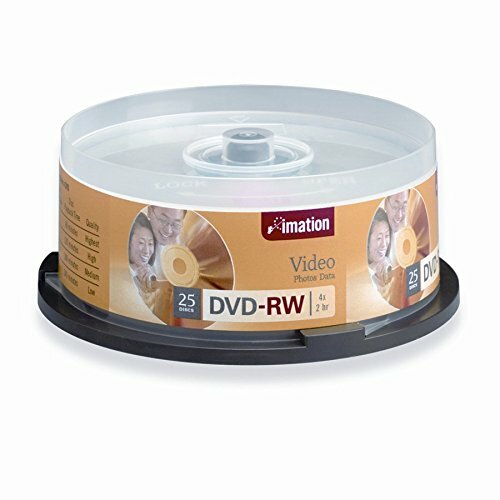 Verbatim 95179 DVD-RW 4.7GB 4X Branded 30pk Spindle, Verbatim DVD-RW offers 4.7GB or 120 Minutes of re-recordable storage capacity, superior recording quality, and compatibility with 1X to 4X DVD-RW writers. 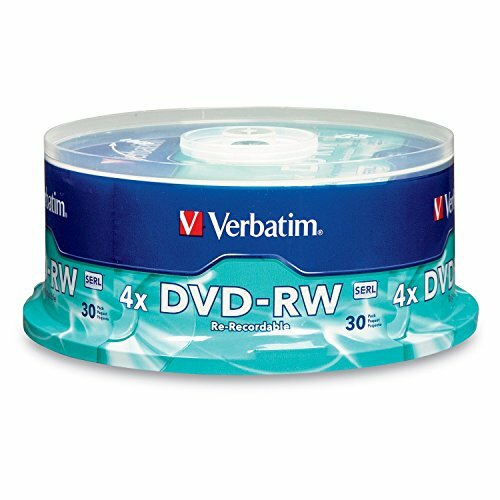 Verbatim 1X-4X DVD-RW is ideal for archiving or backing up 4.7GB of data or 120 minutes of DVD-quality video. Preferred by DVD drive manufacturers, Verbatim DVD-RW media utilizes Super Eutectic Recording Layer (SERL), which minimizes noise during write/rewrite cycles and provides superior archival stability. Verbatim 4X DVD-RW media is compatible with writers from Sony, Pioneer, Apple, Panasonic and other major DVD-R/-RW writers. Now you can create, edit and archive home movies and digital photos while storing and accessing data from one disc. DVD-RW discs capture all digital data brilliantly, and are large enough to hold oversized digital movie files. Now you can create, edit and archive home movies and digital photos while storing and accessing data from one disc. DVD discs capture all digital data brilliantly, and are large enough to hold oversized digital movie files. 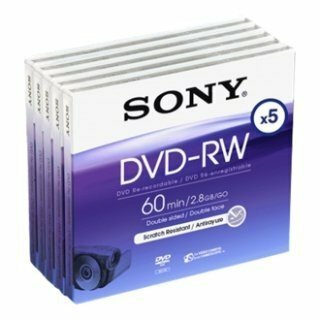 Sony DVD for recording is a relatively inexpensive way to store data and prevent accidental erasure. They can hold 4.7GB of information, which makes it possible to record 120 minutes of MPEG2 video footage with outstanding picture quality. 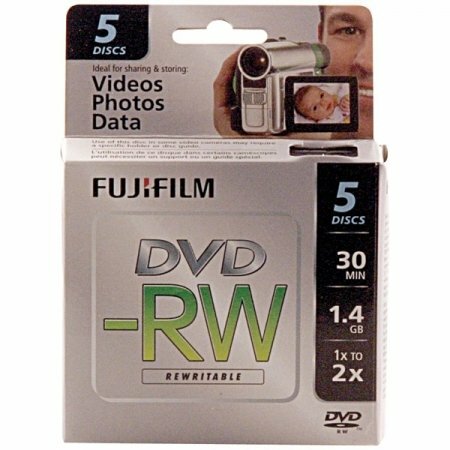 Create, capture, edit and archive home movies and digital photos, while storing and accessing data from one DVD-RW disc. 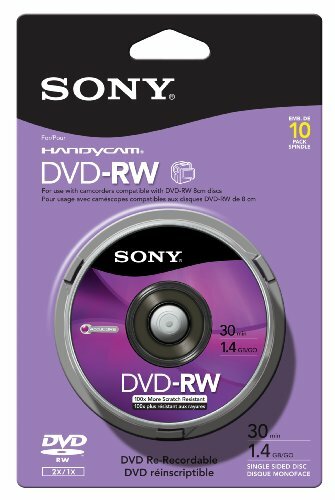 The 8cm DVD-RW re-recordable disc captures all digital data brilliantly, and is large enough to hold oversized digital movie files. This disc can be rewritten up to 1,000 times and you can store up to 1.4 GB of information or 30 minutes of video. 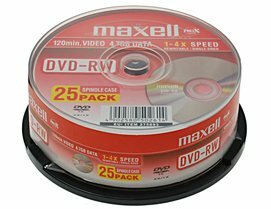 This recordable DVD features AccuCORE technology which is 100x more scratch resistant than standard discs. Designed for non-linear recording for the purpose of editing. DVD-RW media can be recorded and re-recorded (overwritten) up to 1,000 times. Create and store digital video, audio and multimedia files. Compatible for playback with most DVD players and DVD-ROM drives. 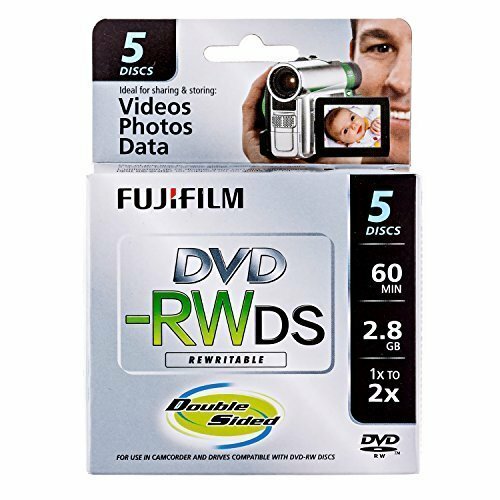 FujiFilm Mini DVD-RW discs offers rewritable recording capacity and has 1.4 GB capacity, providing 30 minutes of recording time. They are suitable for use in camcorders and are ideal for sharing video, photos and data. This package includes 5 discs. Create, capture, edit and archive home movies and digital photos, while storing and accessing data from one DVD+RW disc. 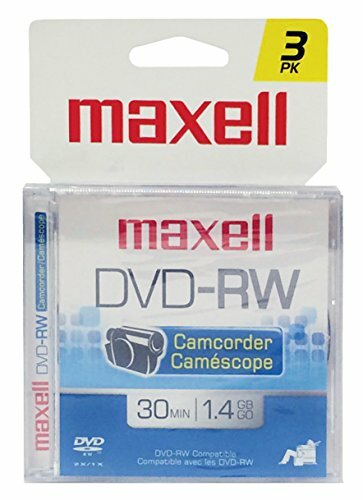 A perfect companion to your DVD Handycam camcorder. 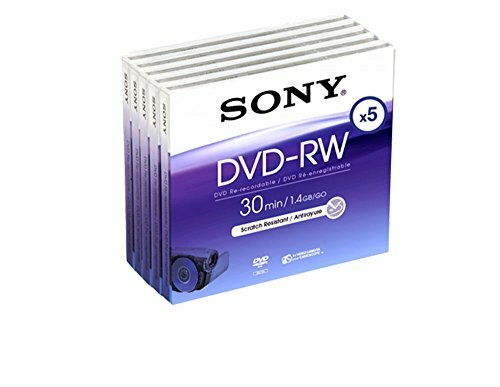 The DVD+RW rewritable disc captures all digital data brilliantly, and is large enough to hold oversized digital movie files. Compatable with camcorders that use DVD-R 8MM discs. Ideal for sharing and storing videos, photos and data. 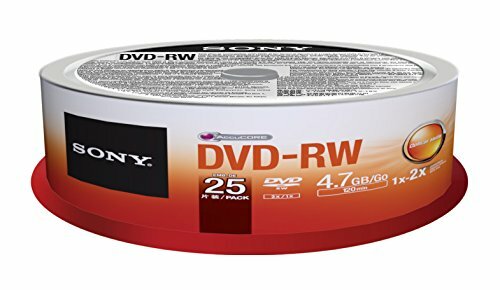 Discs designed for use in DVD-RW compatible devices for recording video. Can be written on more than once. 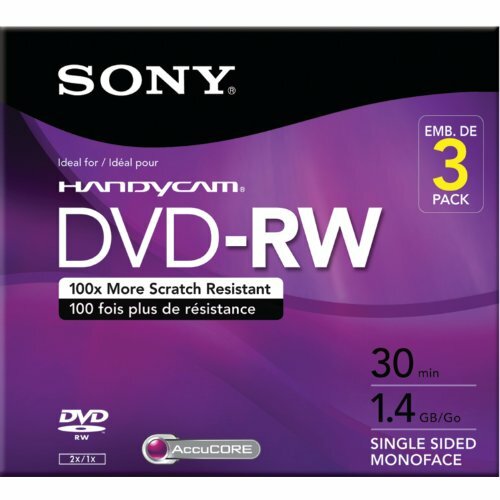 Designed for use in DVD-RW compatible camcorders, computer drives and video recorders. 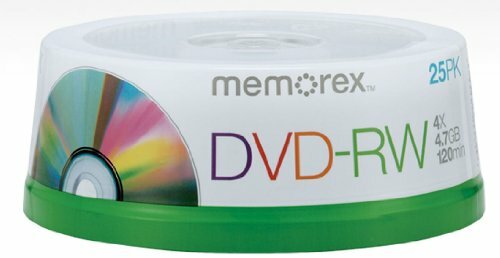 Can be played back on compatible DVD recorders/players and DVD-ROM computer drives. DVD-RW media can reliably be rewritten up to 1,000 times and can store up to 4.7 GB of data or approximately 120 minutes of video. 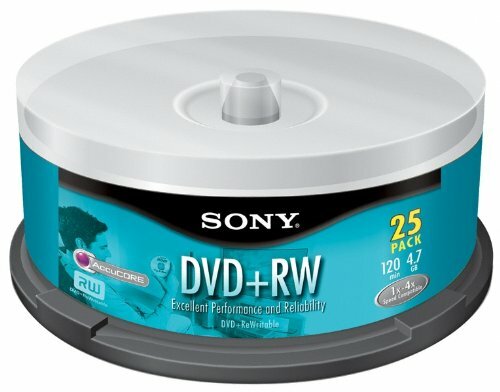 DVD-RW has a write speed of up to 4X. 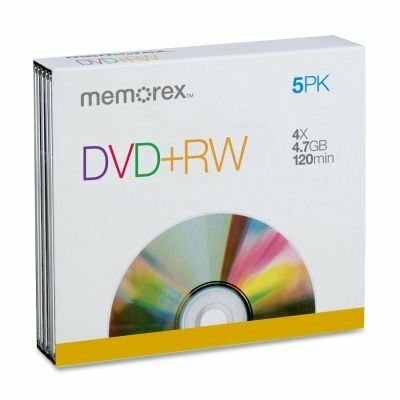 Transfer home movies from VHS or 8mm cassettes, back up computer hard drives or save large files with DVD-RW media. 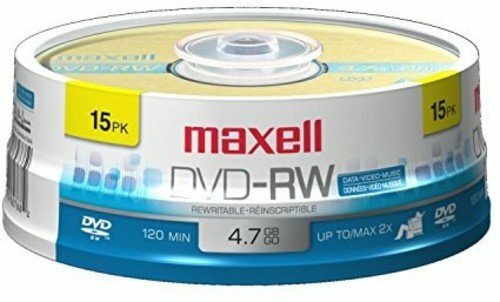 Offers at least 6.5 times more than on a CD-R/RW disk. Ideal for storing multimedia presentations, photo archiving and data preservation. Disclaimer Statement(s) - The capability to write standard CD/DVD formats is drive dependent., Recorders, players and drives will play standard CD/DVD disc formats.